“London by the Sea” is what they call Brighton. Perhaps, a more accurate descriptions would be Londoners by the sea to take into account the hoards that come down each summer weekend. Still though plenty of foot traffic in the city means even more watering holes popping up to cater to them. At present there are 950 pubs in Brighton. With a high number like that even the best of us needs a little help from a friend to find ourselves to the good ones. 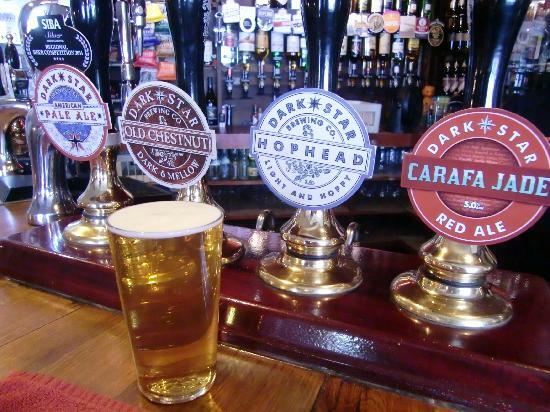 Let this guide be your friend, some of the best pubs in Brighton are. Located conveniently between the train station and the Brighton beach this rustic cheery pub is a great place to fall into for a few. Home of the Dark Star Brewing Company you can expect varied beers on tap, even a few esoteric selections like coffee beer and cherry beer. Gingin is home to some of Brighton’s most inventive cocktails. Graced with leather sofas, large sleeping beauty’esque mirrors, chandeliers, and an intimate, dark basement this bar is popular with the Kemp town locals. If that all wasn’t enough Gingin serves some of the highest end bar food this side of London with choices available such as duck and mushroom pate and smoked salmon. Try the Rocky IV cocktail made of raspberries, tuaca, dark raspberry liquor, champagne… delightful! The Hop Poles is a Classic English pub in appearance with a nicely varied menu of continental dishes. Great for an inexpensive meal- including a Sunday Roast – or to sit in the covered and heated back garden with a mixture of backpackers, students, and hip locals. A bar that oddly makes you feel that you’re on a ship out to sea. The Fortune of War continues it nautical theme with wood panelled walls and rope hand rails on the stairs. One of the best facets of the pub is its location right on the beach front with tables out front as well. The fortune is a popular choice for Brighton weekenders as well as locals using it as a pre-drinking spot before moving on to clubs.